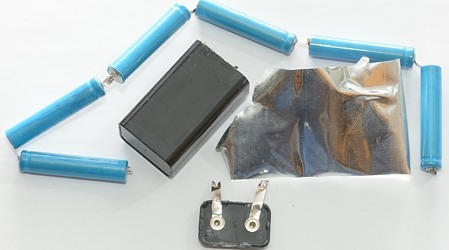 How is a 9V primary (alkaline or zinc-carbon) battery build? 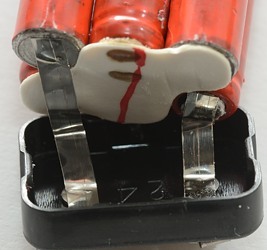 It must be 6 1.5V cells in series, but how is this done? 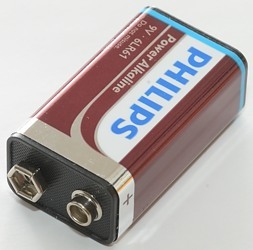 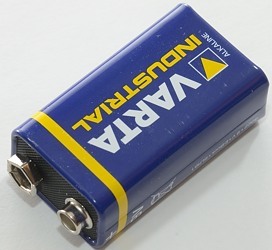 I will check some different 9V batteries and see if they uses the same method. 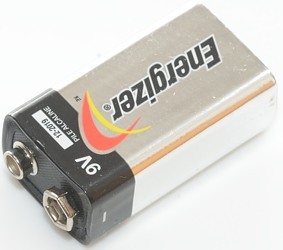 This article got considerable longer than expected and I have only added comments to some of the batteries. 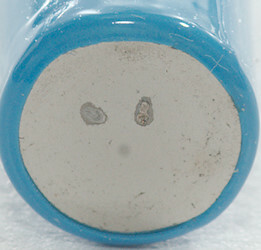 In both types of cells there must be a separator between the positive and negative electrode. 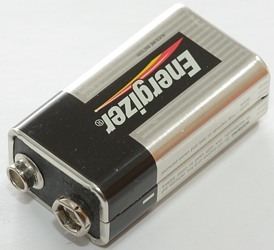 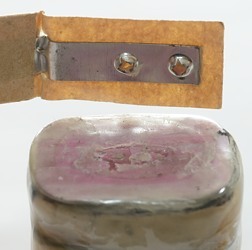 This separator must allow the chemical reaction to take place, but block any current (Or the battery would short itself). 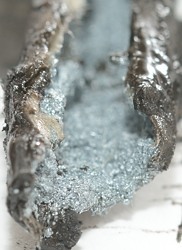 This is usual two layers of fabric soaked in the electrolyte. 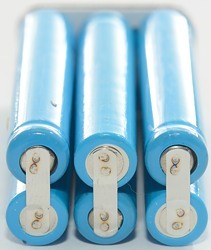 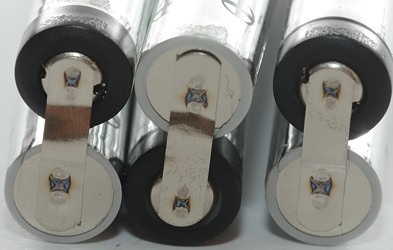 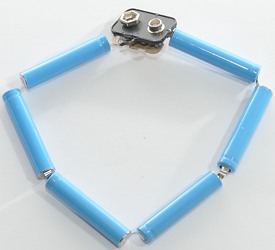 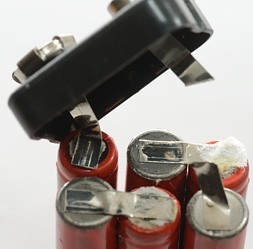 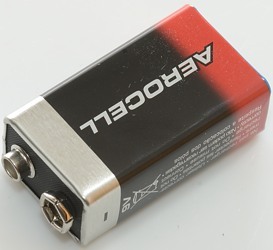 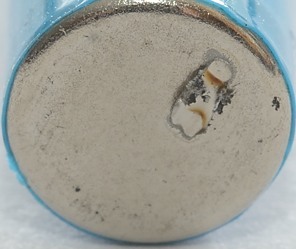 In a 9V battery the cells must also be chemically isolated from each other and connected electrically in series. 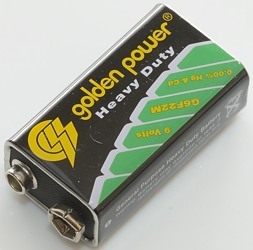 I assume batteries called "Heavy Duty" or "Super Heavy Duty" is zinc-carbon. 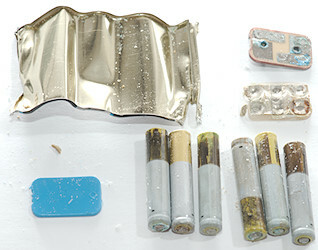 This list shows all the batteries I have looked inside. 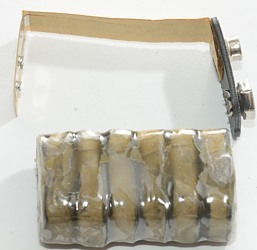 There is no information where this cell is made, but a guess would be Malaysia. 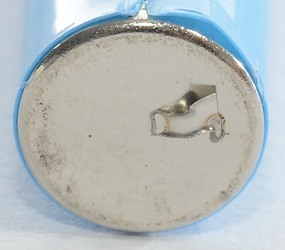 This battery is not marked with any country. 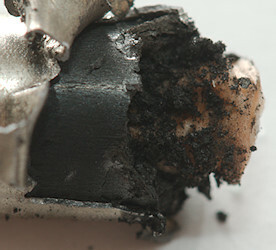 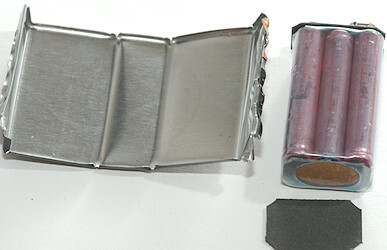 This construction is used on many quality batteries. 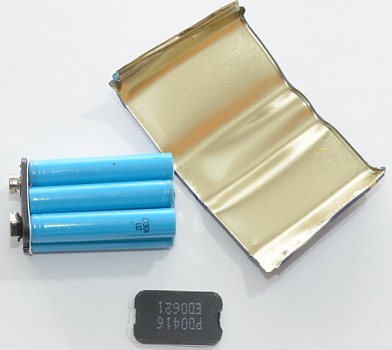 This battery has a US patent inside. 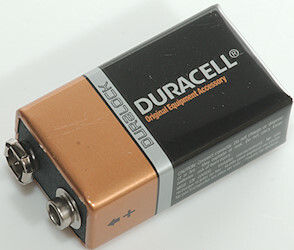 This must be one of the better Duracell alkaline batteries. 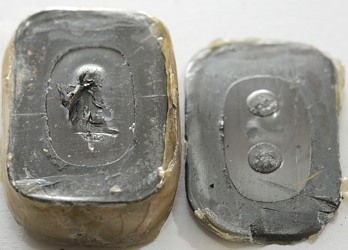 It is not too old yet. 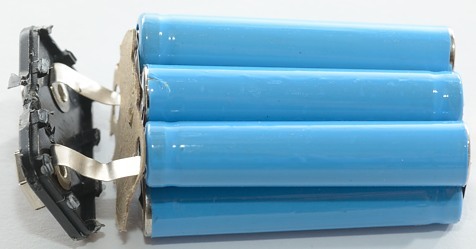 Six cells and with a nice holders for the cells. 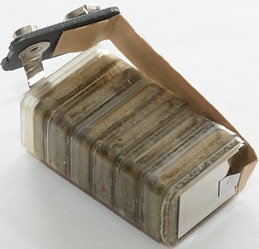 I wonder if the dirty looks is from usage (Can it get around the metal can?) 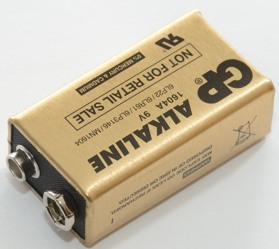 or from the factory. 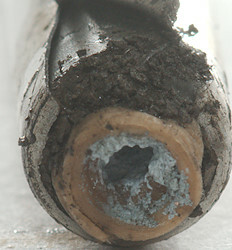 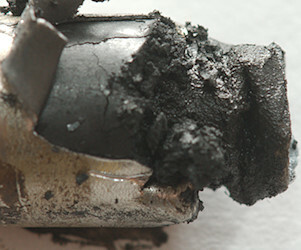 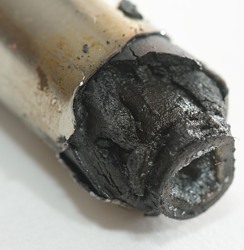 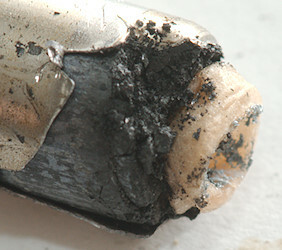 Oops, this battery do not look very good, it has leaked. 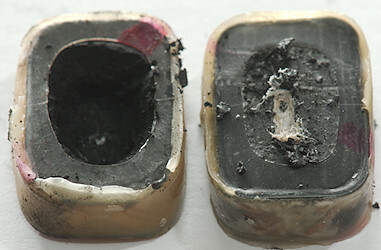 At least it has stayed inside the battery. 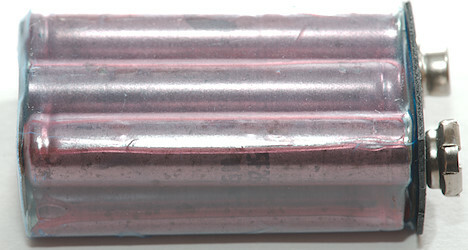 The top do also use welded strips for connection. 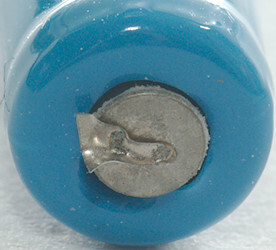 As always the cells are in series. 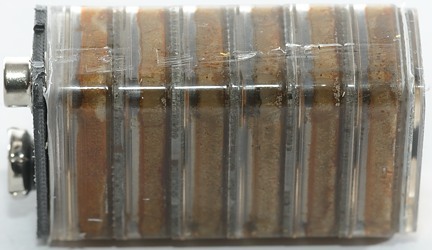 The leak must have moved under the plastic for the cell to looks this way. 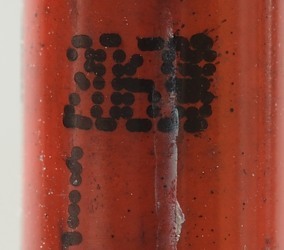 The printing on the cell is rather difficult to read. 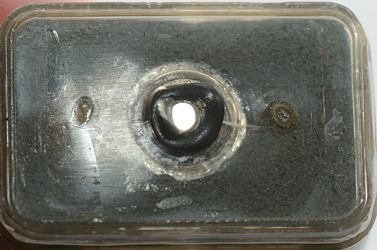 The marks on top and bottom is from the welded strips. 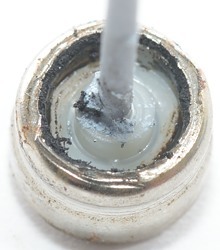 The negative center pole looks like a nail. 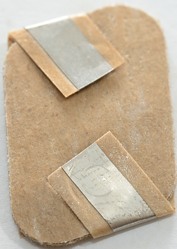 As usual it goes into some zinc paste with a bag around it. 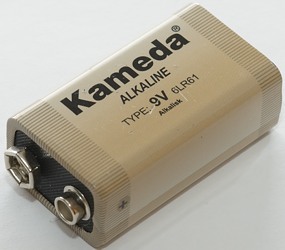 One of the big battery brands, how do they make the battery? 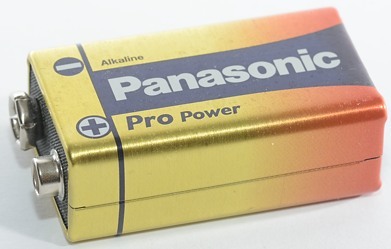 They make it in USA and this battery is fairly old. 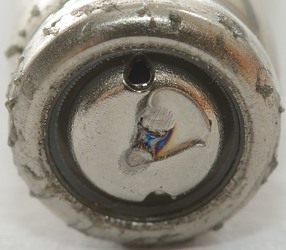 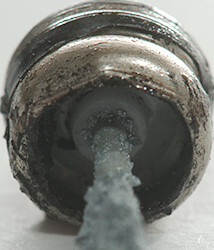 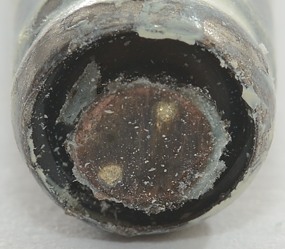 When the metal is removed everything fall apart, all the connections are by pressure only. 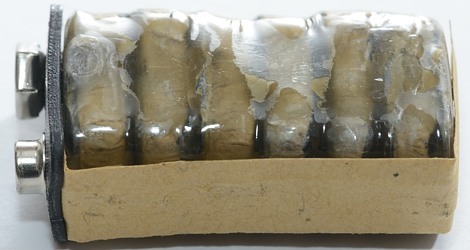 The clear part at the bottom is some "soft" stuff to apply pressure. 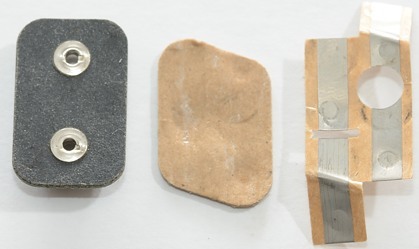 Both top and bottom are some paper with metal foil on it. 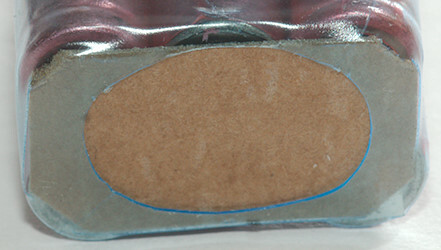 Top is paper with foil around a piece of cardboard. 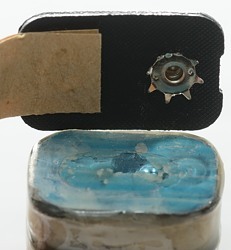 The cell looks nice for its age (no leaking), as usual (inside 9V cells) the can is plus and the top is minus. 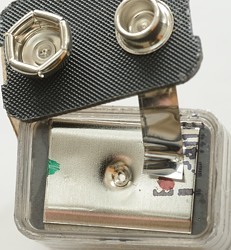 Notice that half of the can covers the insert with the top, this looks like a way to easier put it together. 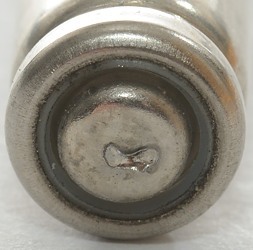 The top is a nail into the center of the battery. 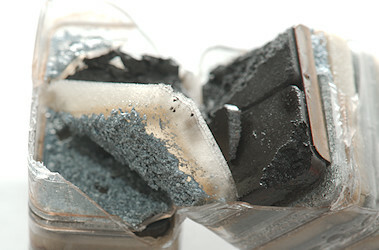 Where there is zinc (Rather green due to age) and a bag around it with the outside filled with carbon. 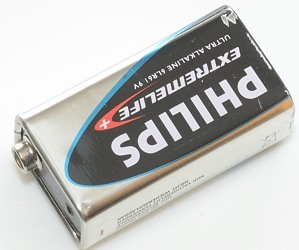 Under the metal foil is a metal can. 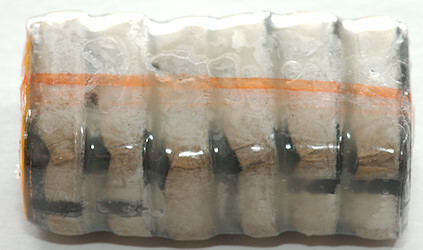 At the bottom is an extra layer of some soft stuff. 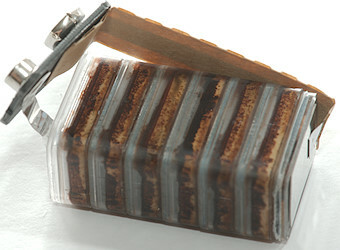 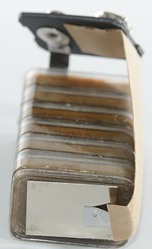 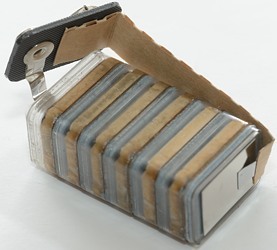 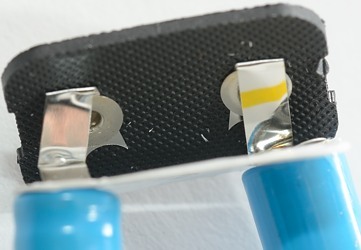 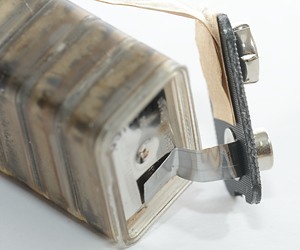 The battery had a protection strip across the terminals when new, this strip starts inside the can. 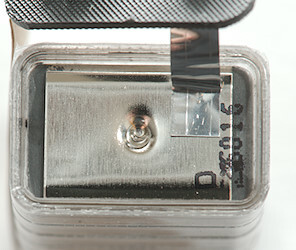 The top connnections are isolated with some paper. 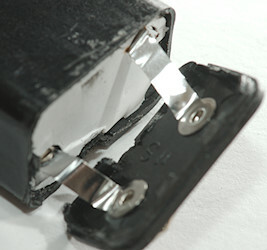 It does not look like there is a patent on this battery. 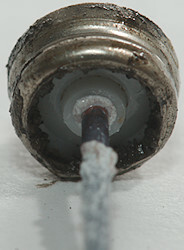 As usual connection is done by pressure. 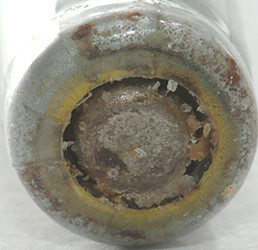 It looks like this battery has started to leak. 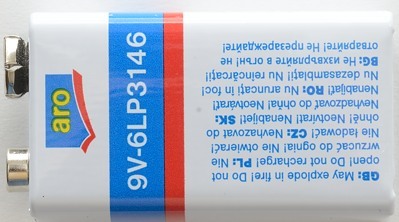 The plus side is marked red, the minus blue. 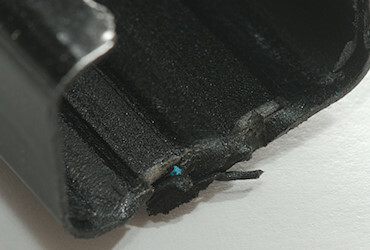 The minus side is carbon and it is soft, on the plus side is some sort of rubbery chemical isolation on top of the Zinc plate. 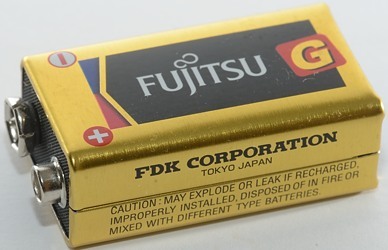 A Chinese brand, but made in Malaysia? 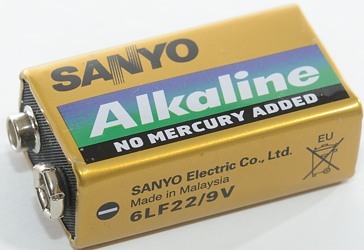 It looks exactly the same as other Malaysia made batteries. 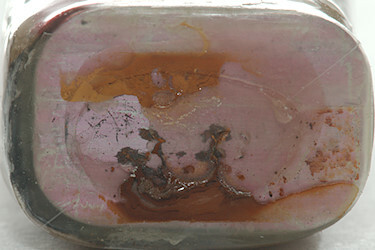 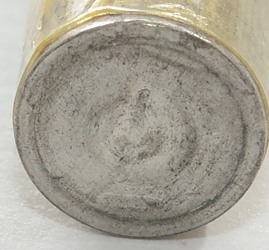 This is one of the few cells with metal bottom. 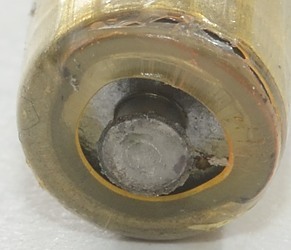 Connections to the battery pack are only by pressure. 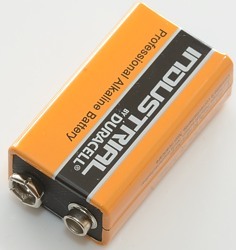 The positive side is marked with orange color. 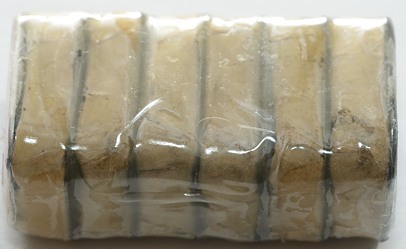 The cells are wrapped in two layer plastic, the inner layer is for each cell and on top of that an outer layer that keeps the pile together. 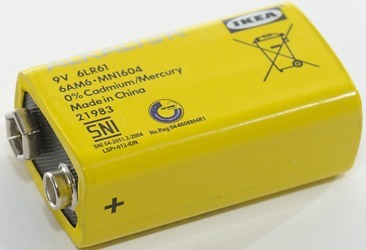 The Ikea battery is different, it do not have a metal wrapper, but a plastic/metal foil wrapper. 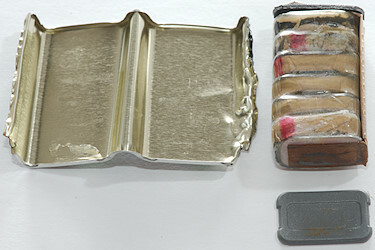 Here is the plastic box with the battery and the wrapper. 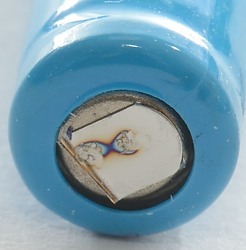 Both connections are at the top. 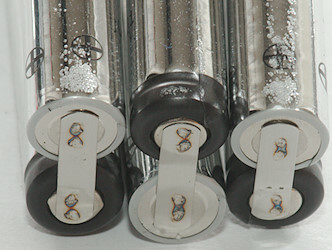 Because it is 6 small cells in series. 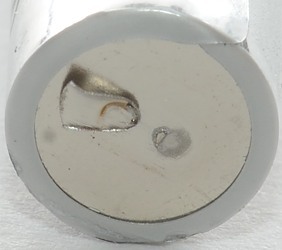 They are about the size of AAAA cells, but watch out for polarity! 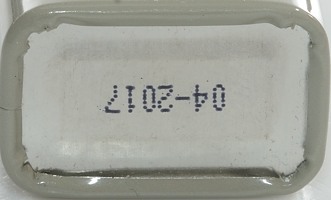 The can is plus and the top is minus. 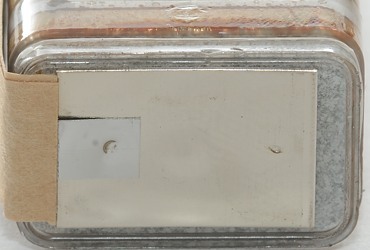 It is a plastic box with a thin metal foil for branding. 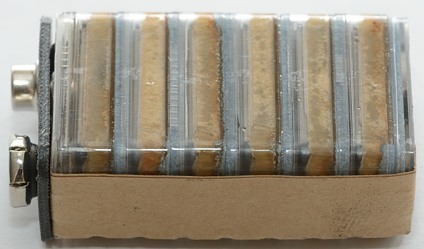 Inside the box is 6 small alkaline cells. 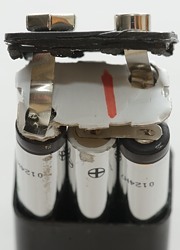 The film covering the batteries is isolating and rather sticky (It was difficult to remove). 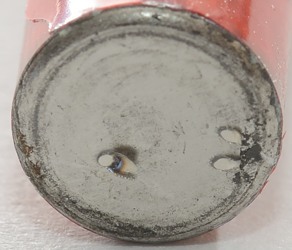 The cells have vent holes, but there is a seal on the inside. 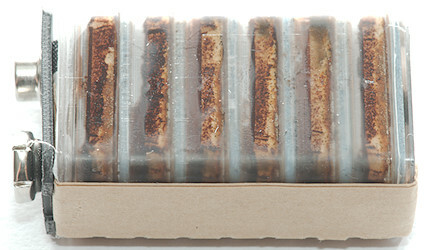 No country only a reference to a Nordic web shop. 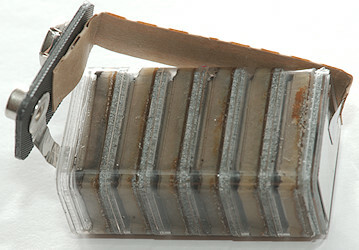 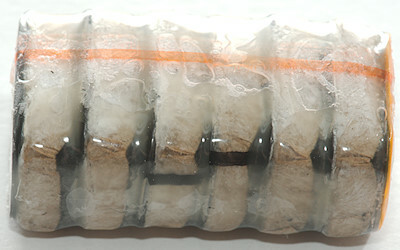 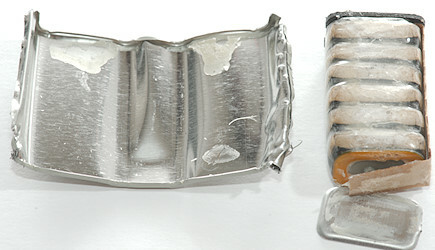 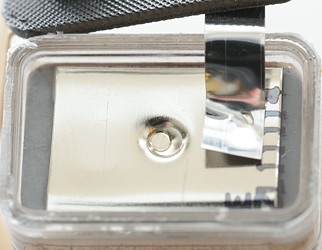 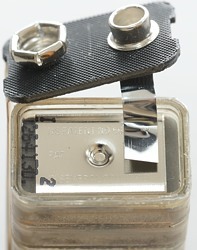 A plastic body with metal foil around it. 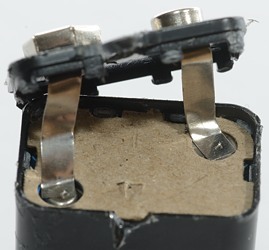 The usual strips connection the cells to the terminals. 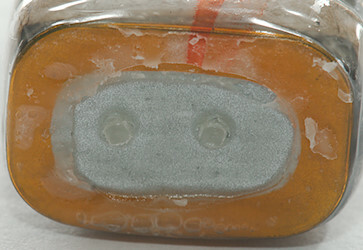 The plastic body is molded to keep the cells in place, this is done on all plastic cans. 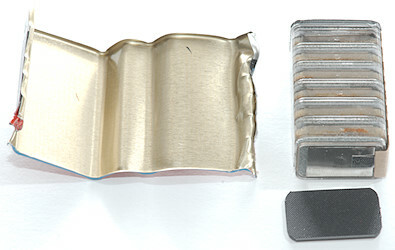 Another brand with metal wrapper. 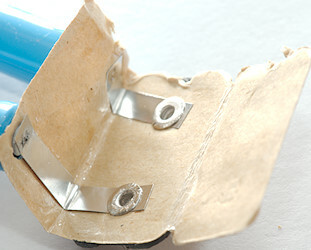 It looks like the typical Malaysia construction. 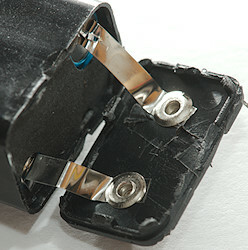 No patent in this battery. 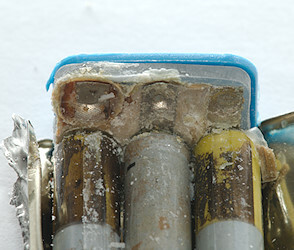 A few more details from the connection. 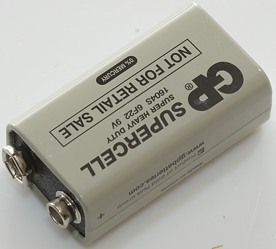 When I got the wrapper partially loose the batteries starting falling out, looks like the battery has leaked, but being a 9V it usual stays inside the battery. 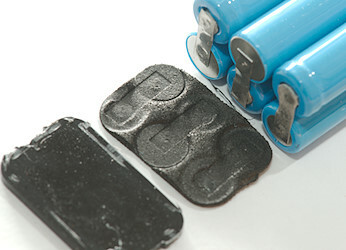 Philips has more than one type of 9V batteries. 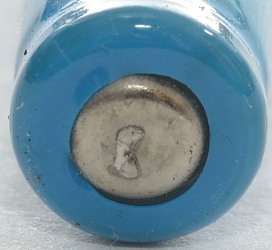 This one is from China. 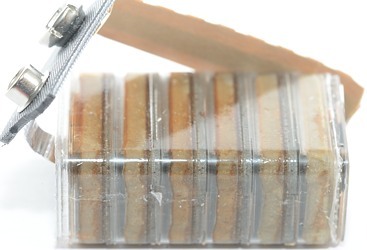 It is 6 cells in a plastic box with a thin metal film wrapper. 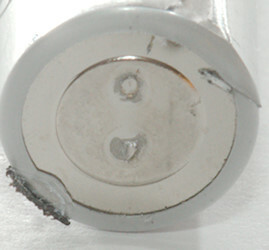 An unmarked cell and as usual with plus on can. 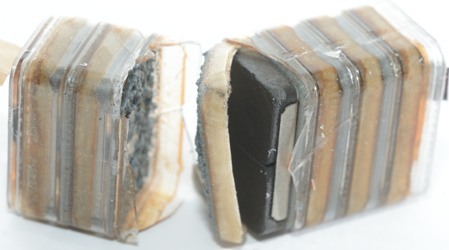 Construction as usual with a pouch containing zinc and manganese oxide around it. 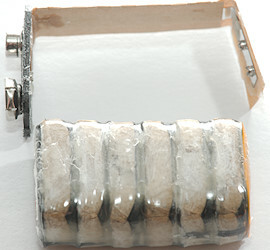 It has a metal wrap around with a plastic bottom. 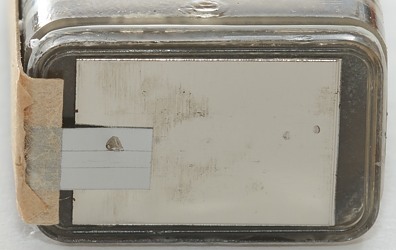 Inside is a block that must be the 6 cells. 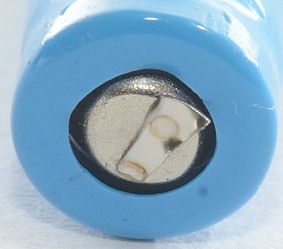 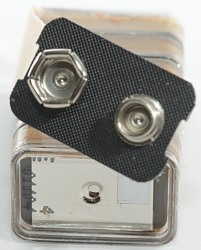 The contacts at the top of the battery is connected to the top and bottom of the block. 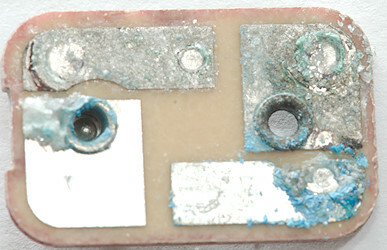 The connections is to connection plates, these plates are then connected to the cells through some small holes. 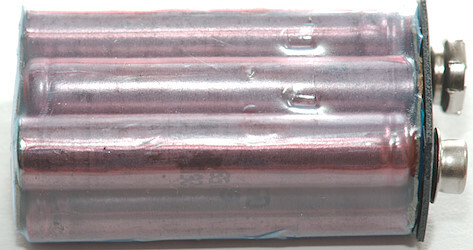 There is different types of metal at the top and bottom. 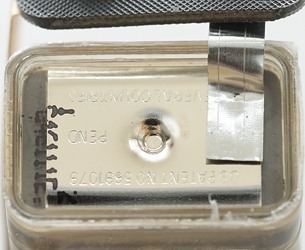 And the holes have a small O-ring to keep them sealed. 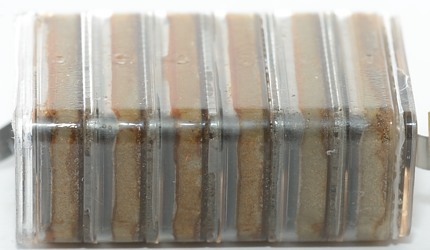 Here are the 6 cells, stacked on top on each other in a plastic block. 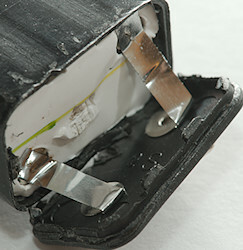 Here I have opened on cell, what is all the stuff in it? 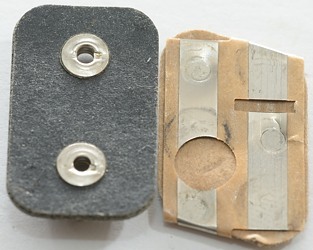 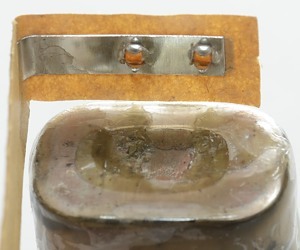 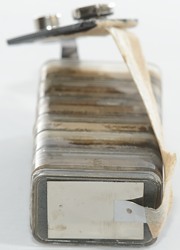 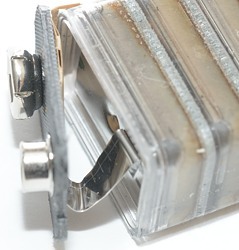 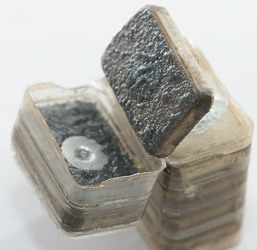 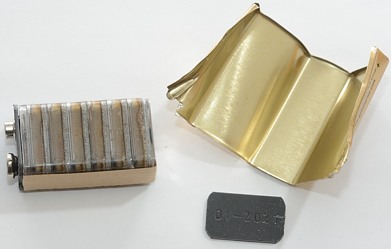 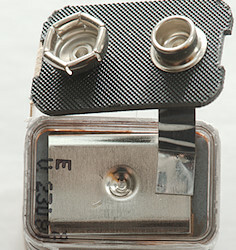 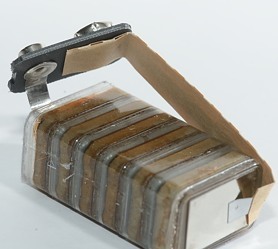 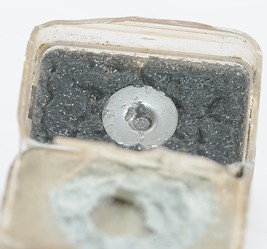 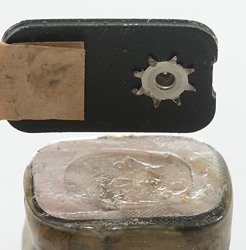 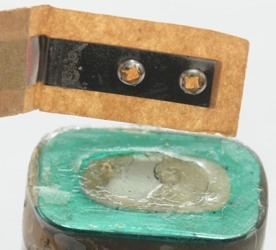 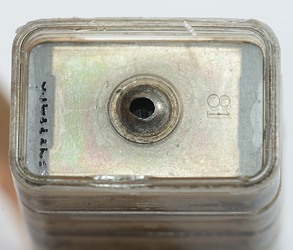 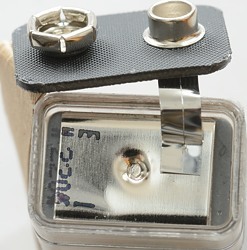 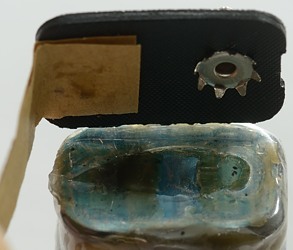 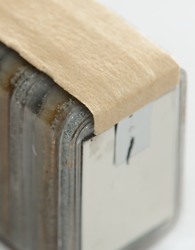 This looks like a block of carbon with a metal clamp for connection to it and a rivet for connection to the next cell. 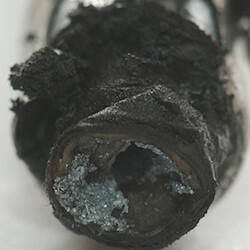 The carbon and the separators. 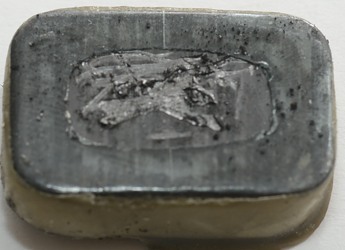 The zinc is a paste and it is fairly black. 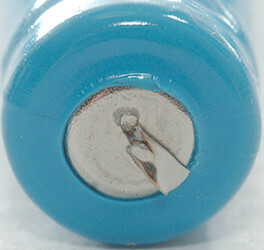 The manufacturer is printed on the battery. 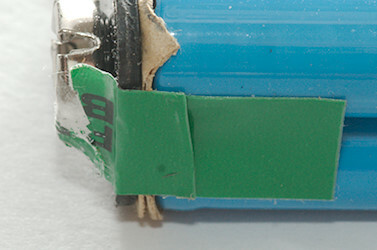 The name on the battery is just a thin plastic wraparound, hidden the metal. 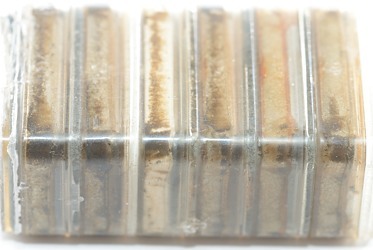 Removing the metal shows 6 stacked cells. 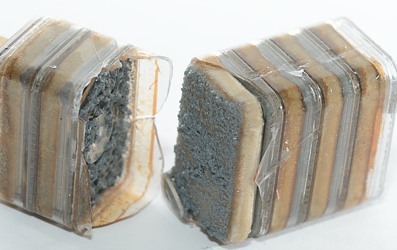 They are held together with plastic film. 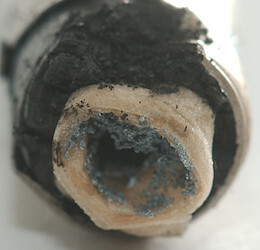 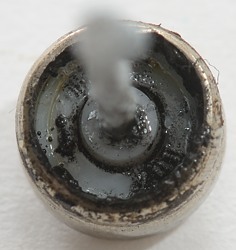 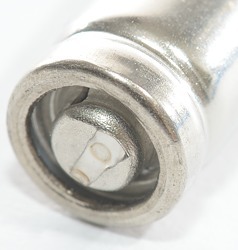 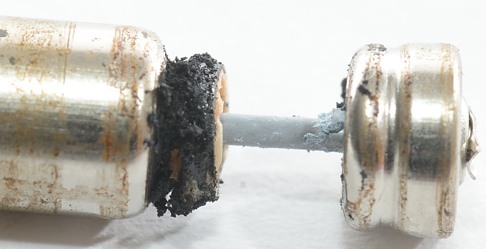 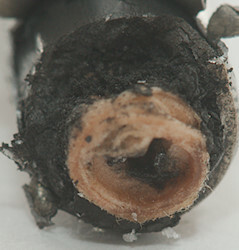 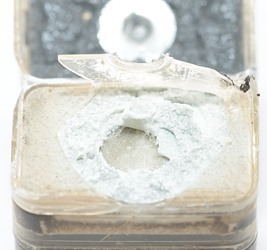 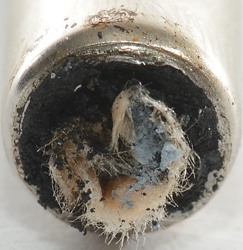 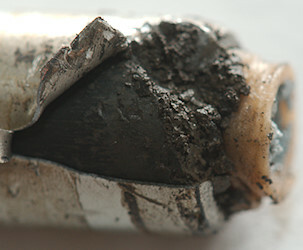 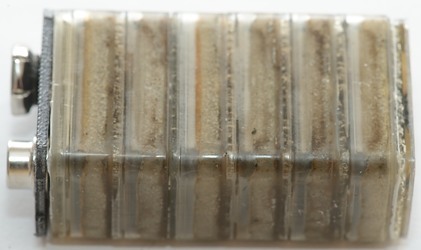 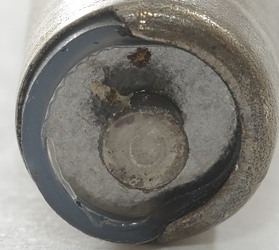 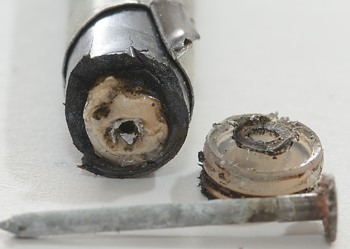 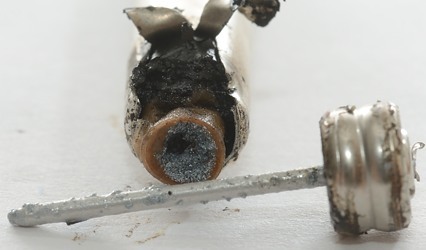 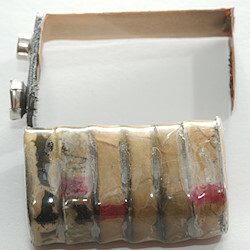 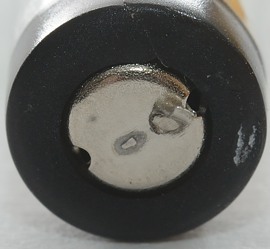 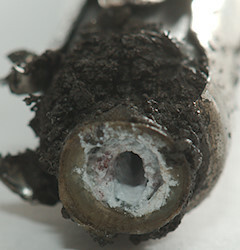 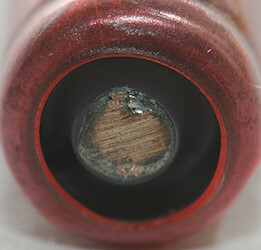 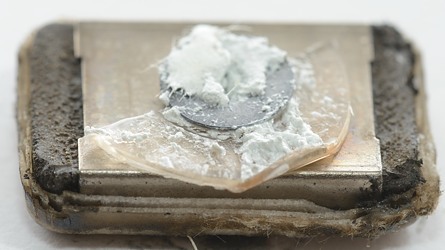 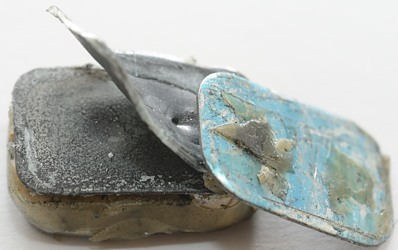 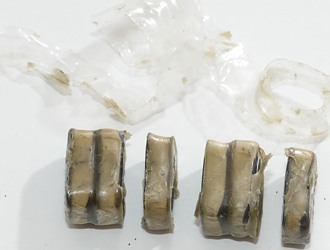 The connection to the cells are not soldered. 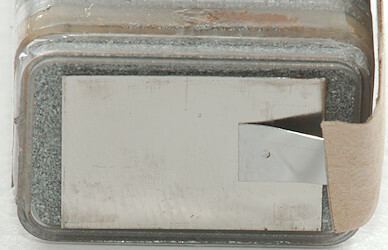 There is some sharp points that is supposed to do the connection. 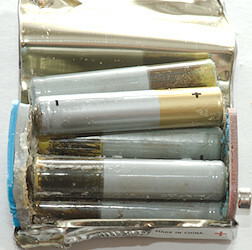 On the plus side and on the minus side. 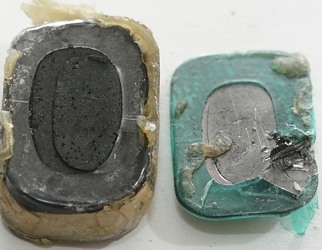 After removing a layer of plastic the cells are mostly loose. 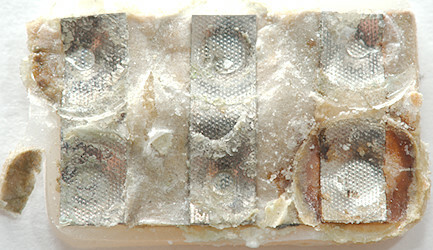 Here are all 6 cells, the top and bottom cell has metal reinforcement. 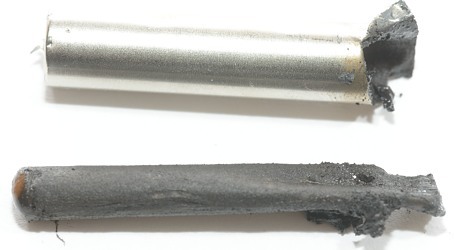 The other is either carbon or zinc. 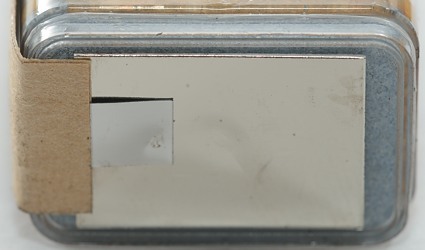 It is easier to see if I scratch a bit on the surface. 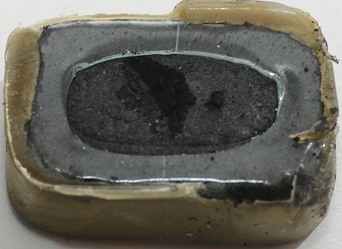 It looks like the zinc has black layer, it must something to avoid making a cell with the carbon, but allow current to pass. 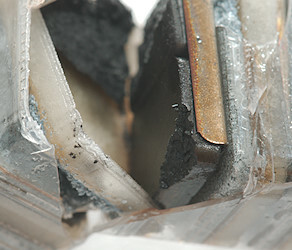 Removing the last layer of plastic and the carbon breaks up. 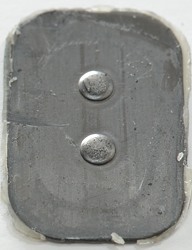 Here is everything: zinc plate, two layers of separator and carbon. 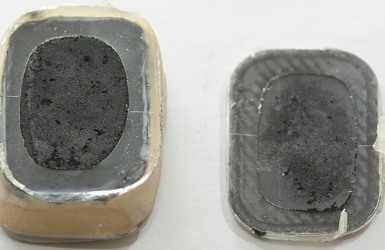 Both the top and the bottom have a metal plate, it is obvious that something is needed over the carbon, but the metal plate at the zinc electrode, is that the zinc plate or an extra plate? 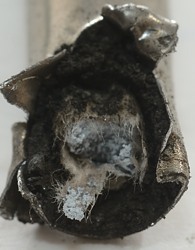 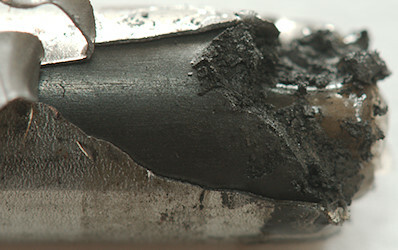 As can be seen here the is some conductive "rubber" between the zinc and an extra metal place. 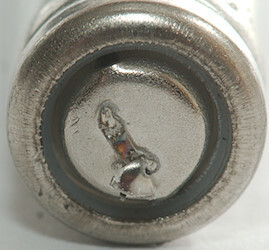 But it is a company name. 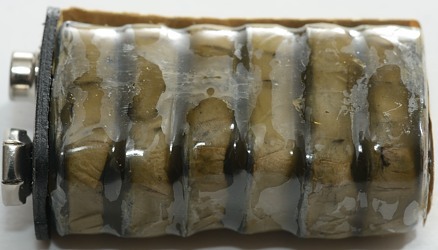 This looks like something I have seen in other cells. 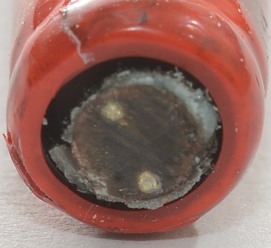 No welded connections, just a crown pressing down on the cell. 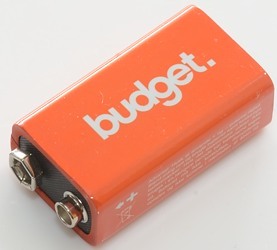 That is the same for both plus and minus. 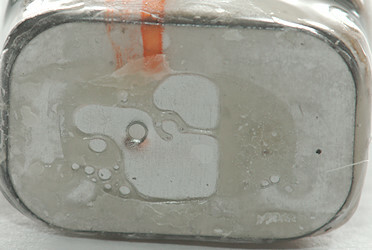 The cells, the smooths surface is zinc, the other carbon. 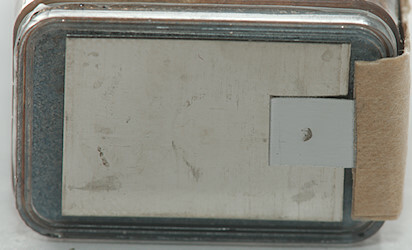 A bit scratching shows it clearly. 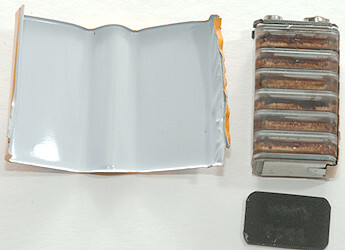 Top and bottom both have protective plates. 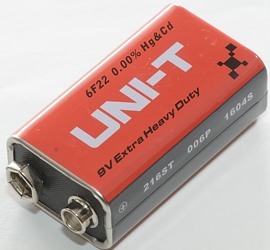 UNI-T is a Chinese instrument manufacturer, I doubt they make batteries. 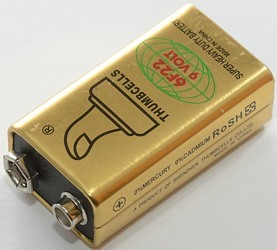 I expect they have bought this from another manufacturer and probably a Chinese one. 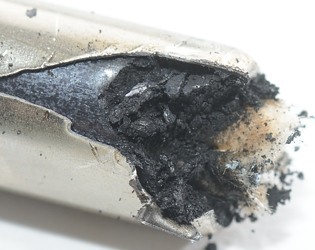 This looks fairly standard for zinc-carbon. 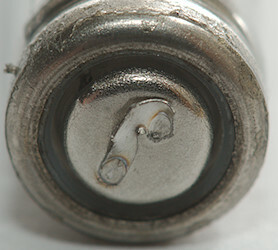 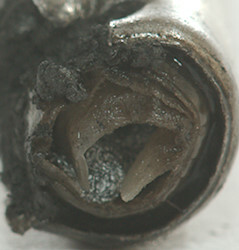 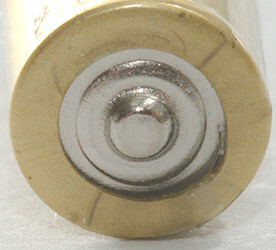 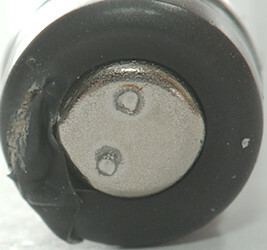 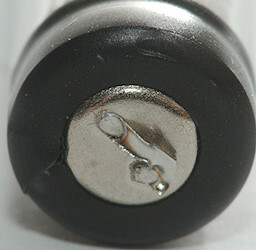 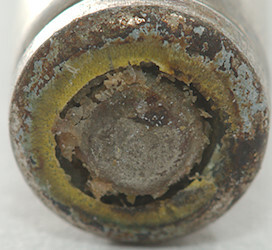 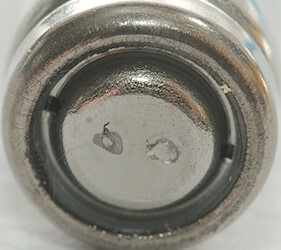 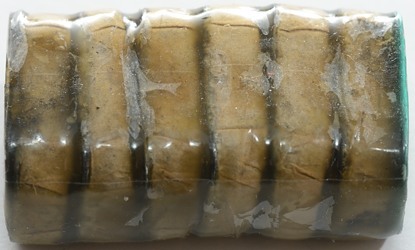 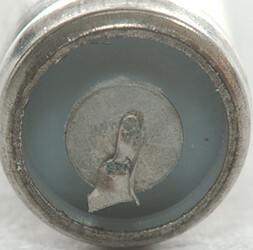 The connection with two crowns to press against the end of the battery. 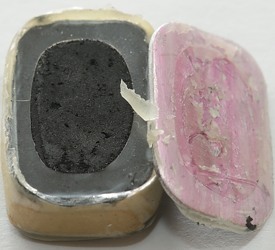 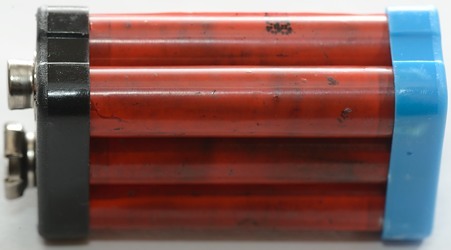 At the red end is carbon, there is an chemical isolation layer between the plate and the manganese oxide. 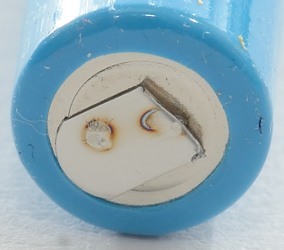 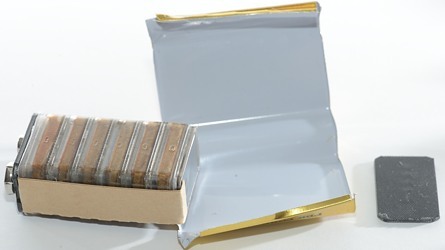 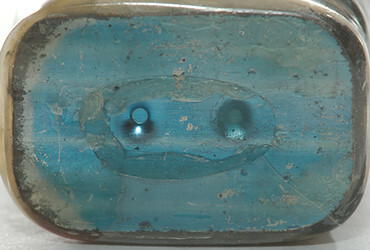 At the blue end is zinc, there is ah chemical isolation layer between the plate and the zinc. 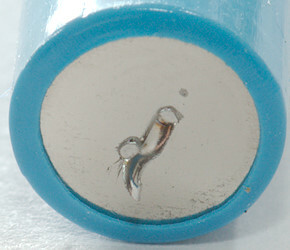 The can is positive and the top is negative on this cell. 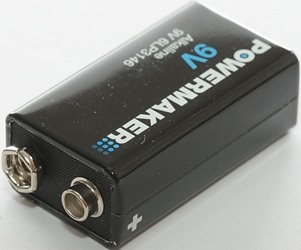 The size is about AAAA, but due to the reverse polarity it is not a direct replacement. 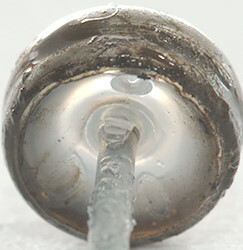 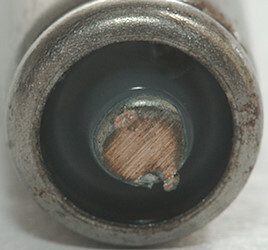 The nail is the negative electrode. 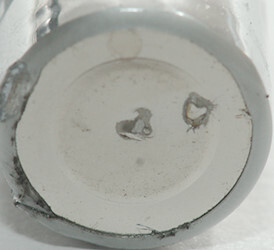 There is some plastic isolation between the negative (center) and the positive (can). 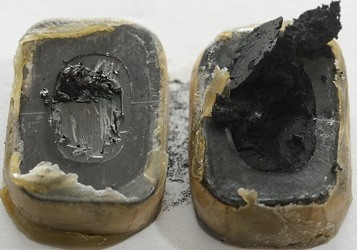 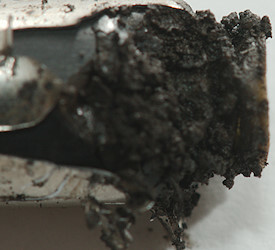 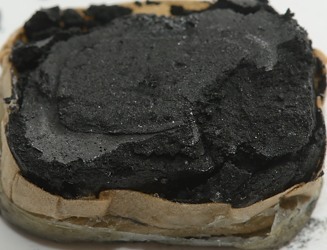 All the black stuff inside the can is manganese oxide. 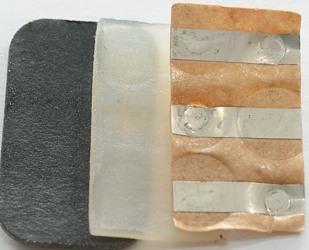 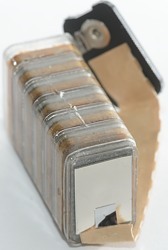 Between the negative and positive electrode material is a separator, it looks like a small bag. 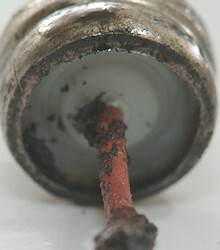 I have pulled it out here. 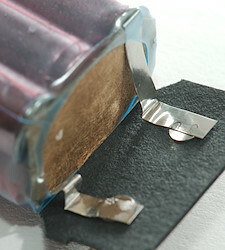 Cutting the bag open shows that it is filled with Zinc powder for the negative electrode. 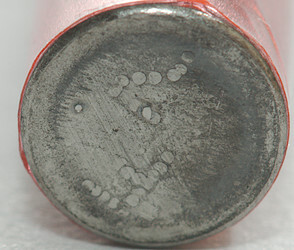 3) Alkaline with round cells. 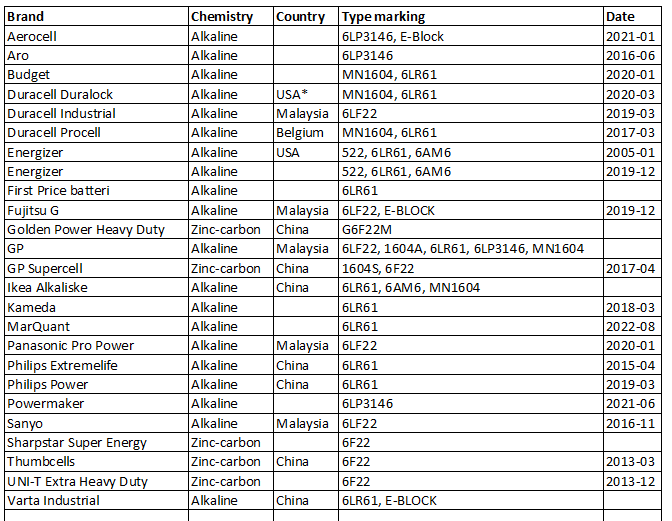 The production of 1) is fairly standard and is always made in Chine, 2) is always made in Malaysia. 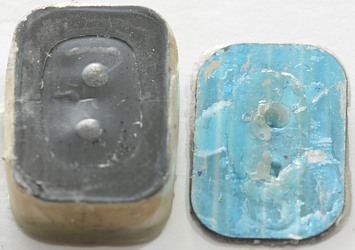 With the round cells there is much more variation, both in construction and where they are made/assembled. 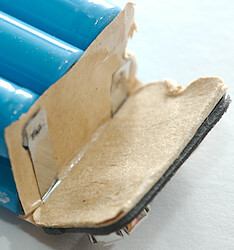 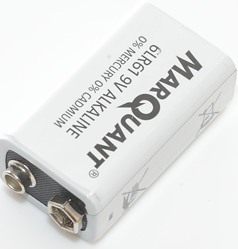 As can be seen from some of the batteries 9V can leak like other batteries, but usual it stays inside the outer box. 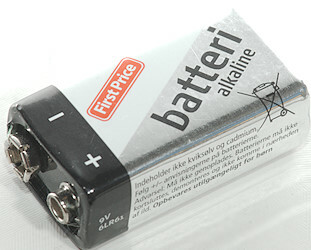 US patent 5691079: This patent describes the tray shape used in the Malaysia manufactured batteries. 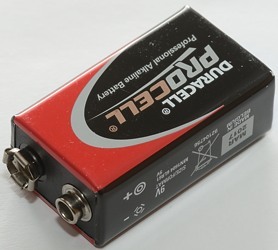 It was applied for in 1995 and granted in 1997 and it is from a Danish company. 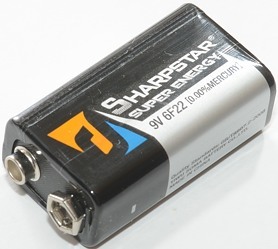 To get as many different batteries as possible I asked a some friends if they had any used 9V batteries, they had!